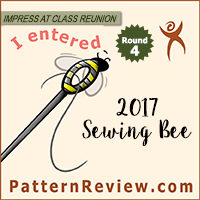 Ok, so this isn’t really part of any of my Sew Geeky plans for the year. I still have a lot of pieces I want to make from my wardrobe plans inspired by The Magicians, and technically I should start working on my plans inspired by Doctor Who, though actually actually I should be making all of the commissioned projects I have stacked up, somehow in the midst of holiday madness, this sweater happened. In my brain I’m calling it my Maleficent sweater, and Maleficent does magic, so maybe I can consider this part of my Magician’s collection? Maybe? If you soft of tilt your head sideways and squint? Honestly though, doing the Sew Your Kibbe series has made me very aware of what patterns I have in my stash, and I kept seeing Burda 6476 and wanting to wear it, because it looked so warn and snuggly. Wanting the sweater was just sort of one of those low level needs. Ultimately, this project came about because I needed to order fabric for a different commissioned project, and while on Fashion Fabrics Club I found this amazing sweater knit and I had to have it. You know, as you do. So when it all came and I opened it, it was amazing and I needed to sew with it. Immediately. And thanks to the magic of the holidays, I did. Was it the best use of my time? Certainly not. But oh well. Pattern Description: Sweater in two lengths, with turtleneck and dropped shoulders. I made view A, the cropped sweater without the hem or cuff bands. Pattern Sizing: Burda sizes 32-44 (US 6-18). I made a size 40 at the shoulder and graded to a 42 at the waist, though in such a loose fitting garment that was probably not necessary. Were the instructions easy to follow? The instructions were great, I love the Burda envelope instructions. They are pretty concise, but the pictures are helpful. I also really like that they tell you to reinforce the shoulder seam with bias tape or fusible tape. Did it look like the photo/drawing when you were done with it? Yes, I think so. My knit is a bit chunkier, so the hem flares out a bit more, but otherwise it is quite similar. As a word of caution – you can see from the image that the sleeve length is quite long on View A because it does not have the cuff band to gather the sleeve end. This doesn’t bother me (I’m always pulling my sleeves down over my hands), but it could be annoying long if you were planning on doing a lot of practically functional things in this sweater. View B wouldn’t have this problem because of the cuff bands. What did you particularly like/dislike about this pattern? I like the style and fit, but I generally like the style and fit of Burda patterns. I like both options in the pattern – View A is sort of cute and trendy, View B is a pretty classic, elongated, relaxed sweater. I don’t know how many versions of View A I need, but I plan to make view B in the future. It is easy to put together (or would have been if my fabric hadn’t been so fussy and thick). The pattern pieces are simple, and this sweater should go together quickly in any reasonable fabric. No dislikes of the pattern. Fabric used: I used a purple/black/silver wool/acrylic/poly sweater knit from Fashion Fabrics Club. It is very very thick and loosely knitted, so I used black stretch mesh to bind all of the seams and hems. It is also only 40″ wide, so I was sort of forced to make view A; I didn’t have enough fabric to fit View B out of the amount of fabric I had purchased. This fabric is pretty soft (if I was a kid I might find it scratchy, but if I was a kid I’d also be swallowed by the thickness of the fabric, so… somewhat moot there). This is a knit, so I’ve now got lots of fuzzy bits all over the floor that I need to clean up. It’s sort of like sewing with fur, but not quite as bad. 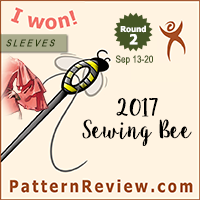 Pattern alterations or design changes you made: I didn’t make any adjustment to the pattern, but I did use a binding method to do the seams because my fabric was pretty loosely woven. This means my seam finishes are a bit different from the instructions in the pattern. Would you sew this again? Would you recommend it to others? Yes and yes. I love this pattern! It would be a great first Burda or first sweater pattern for a new sewist, but it would also be a fantastic pattern for someone who just wants to make a cute sweater. And I definitely want to make View B in the future. Conclusion: Great pattern! I was so excited when this fabric came that I made this sweater within a week of it arriving. I definitely need to made a shirt with a curved hem to wear under this sweater (possibly the Jalie Mimosa?) because I really love the way Burda styled this sweater on the pattern envelope. This knit is really great for a cool day outside – it doesn’t get too cold where I am, but this keeps me pretty warm and snuggly. Too hot to wear indoors; I may need to make a second one in a lighter fabric if I want to have it as part of a more versatile outfit. But for now I’m super excited with this sweater because it feels really unique and I expect I’ll have a chance to wear it quite a bit the rest of fall. Looks absolutely yummy! Chestnuts roasting on an open fire…. Beautiful! Absolutely LOVE the extra long sleeves…That hem is cute too, and seems to be a thing in the shops these days. I might have to get this pattern! It’s super easy! The cropped version only has 4 pattern pieces, and the longer version only has 6 (for the hem and sleeve bands). If I hadn’t used the world’s thickest knit I could have serged it up in less than 2 hours! Love this! Can you provide more detail about how you bound the seams? I would love to work with a chunky knit but I have no idea how. Gorgeous color! So good on you. I can see why you had to have it. I have shied away from those chunky sweater knits, thinking that they would completely unravel and even serging the seams wouldn’t be enough to hold them together. It is too thick to go through the serger nicely so I had to get creative. I love me some chunky sweater knit! This is so cute!!! I love this colour on you and your eye make-up looks fantastic with it too!